Fall Fitness Tip - Energetic Juniors - Contact Us! 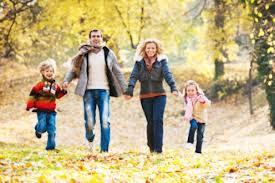 How about starting a new Holiday tradition with your children, and adding a stroll after the meal? Studies show that walking after a meal aids in digestion, and it will burn those extra holiday calories. It’s also much easier to talk while walking than while your mouth is full. Go outside for a walk, and enjoy the colors of all the leaves falling from the trees. On your walk, collect 5 differently shaped leaves. When you arrive home, make up your own yoga pose that resembles each of the leaves that you chose. Remember to hold your poses for at least 10 seconds. Breathe in through your nose and out through your mouth.